I’m going to make this short and sweet because I just had a baby! Sleep is a thing of the past so it’s almost impossible for me to finish a thought before trailing off onto the next one. Plus I'm typing this while holding a sleeping baby. Isn't holding a sleeping baby the most luxurious thing in the world?? What was I saying? Oh yeah. I'm a mom! Say whaaaaat?? My due date isn’t until February 19th! I’m not ready!! 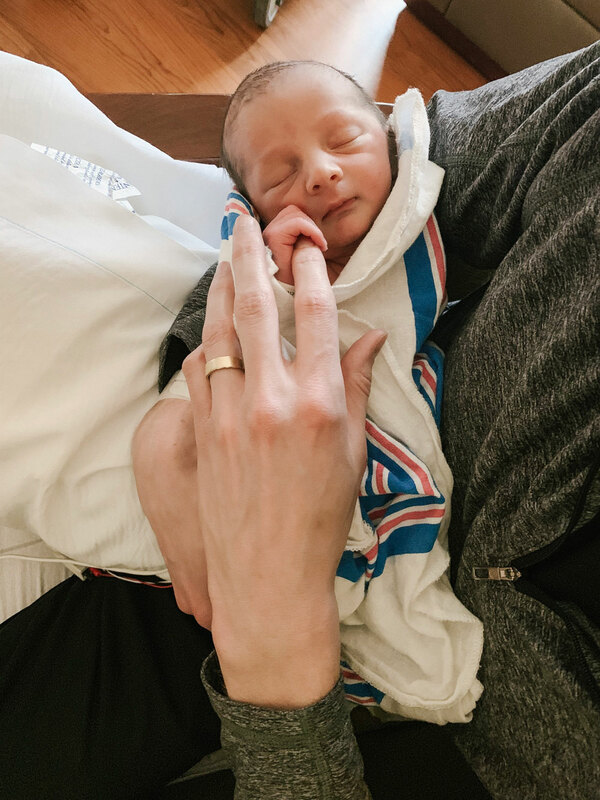 Five weeks later I’m not fully confident in that last statement, but I can happily report that everything went swimmingly and an hour after being told I was having a C-section I was holding a beautiful baby boy. My perfect Desmond Parker. 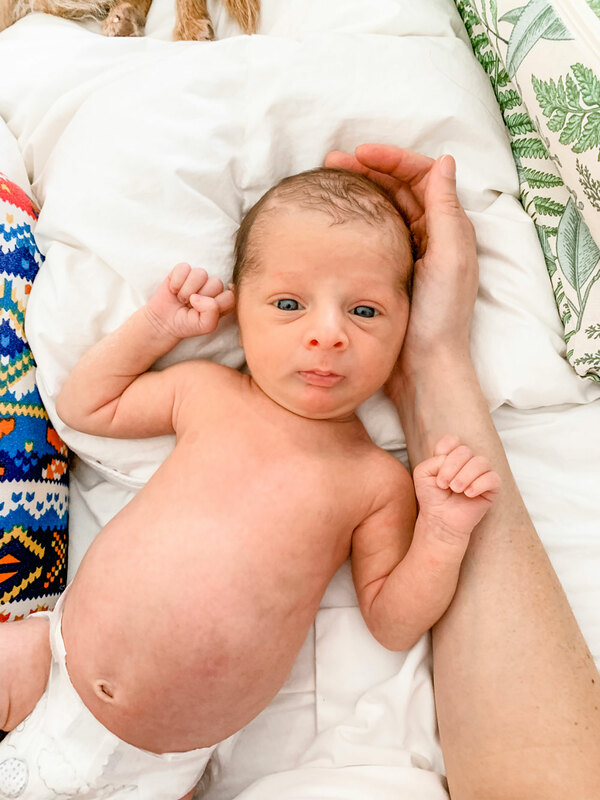 After entering the world two and a half weeks early, Desi spent a few days in the NICU getting extra oxygen until his lungs became strong enough to work on their own. 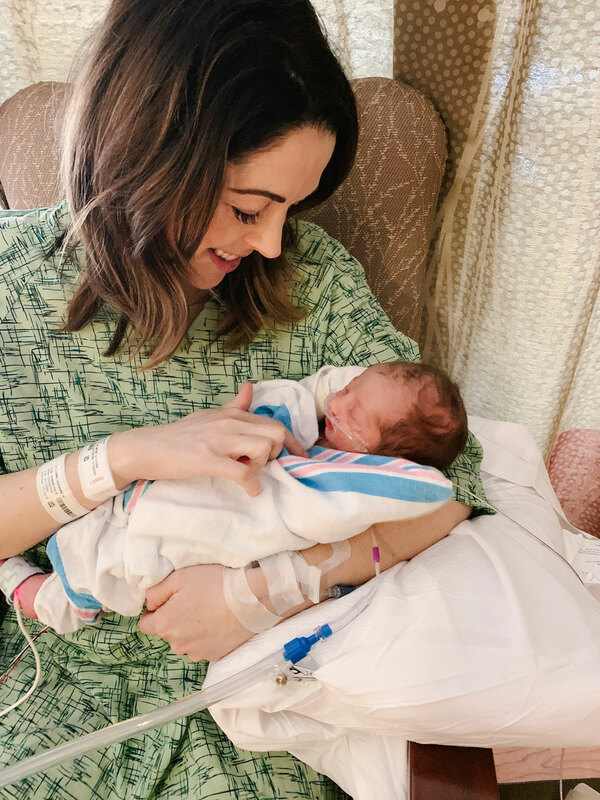 John and I greatly appreciated the time we got with the special care nurses and how gracious they were in showing us everything from breastfeeding to bathing. Where does SQ go from here? At the moment I am soaking up every smell, yawn and sweet little noise. Desi, Scrap and I spend most of our time cuddling in bed pretending like the outside world does't exist. We've gotten very good at it too. 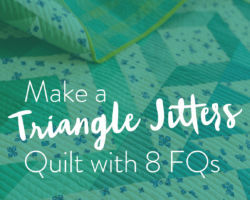 Below and above is the Triangle Jitters quilt pattern. Above is the Campfire and Modern Fans quilt patterns. 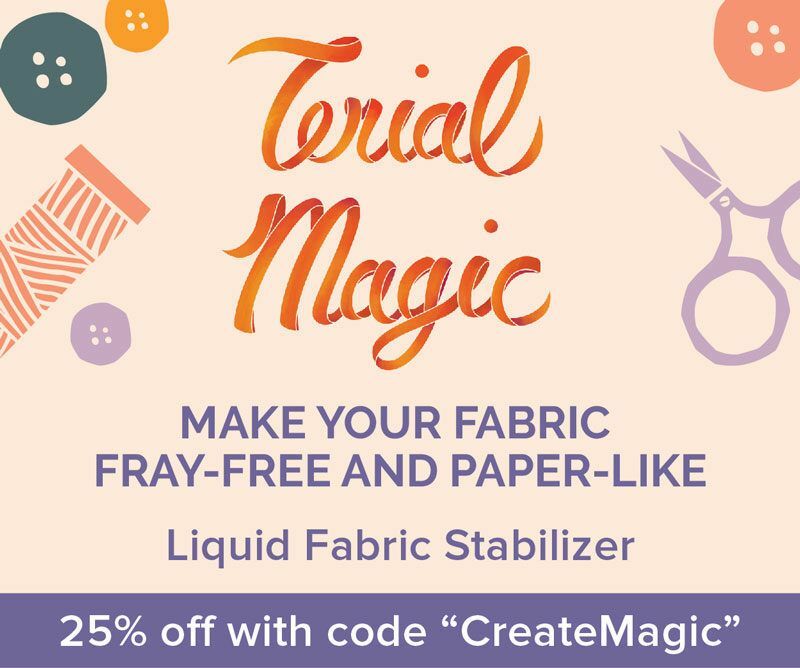 I may have just gotten a lot busier, but when I decide to jump back into the quilting world, I'm jumping in with a BANG! On Thursday, April 4 the Mod Mountains quilt pattern will be available as a direct PDF download in the quilt pattern shop. The pattern will include baby, throw, twin and queen/full sizes. 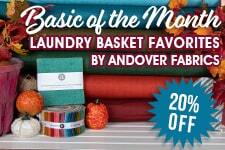 This pattern is fat quarter friendly and PERFECT for using up your scraps! In fact, I highly recommend raiding your scrap bins to making some of these mountains. The smallest scraps only need to be about 5" x 4" – so not that big! 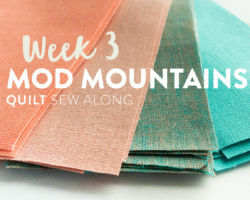 A week after the Mod Mountains pattern release we will launch into a sew-along! 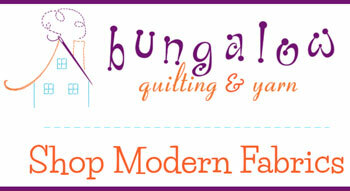 If you're curious what to expect of an SQ sew-along, check out the Modern Fans sew-along we did last fall. 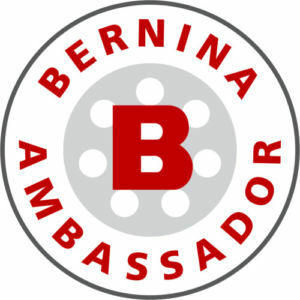 It will include extra video tutorials, live chats with yours truly and some pretty cool prizes. I'll post more details when we get closer to the launch date. So sweet, Suzy.. take all the time you need! You’re making us all cry! Oh my goodness, her sure is perfection, isn’t he!!! He’s so sweet! What a precious gift! 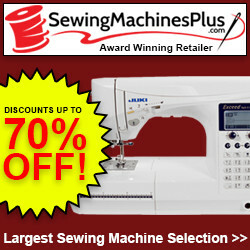 Looking forward to the sew along! 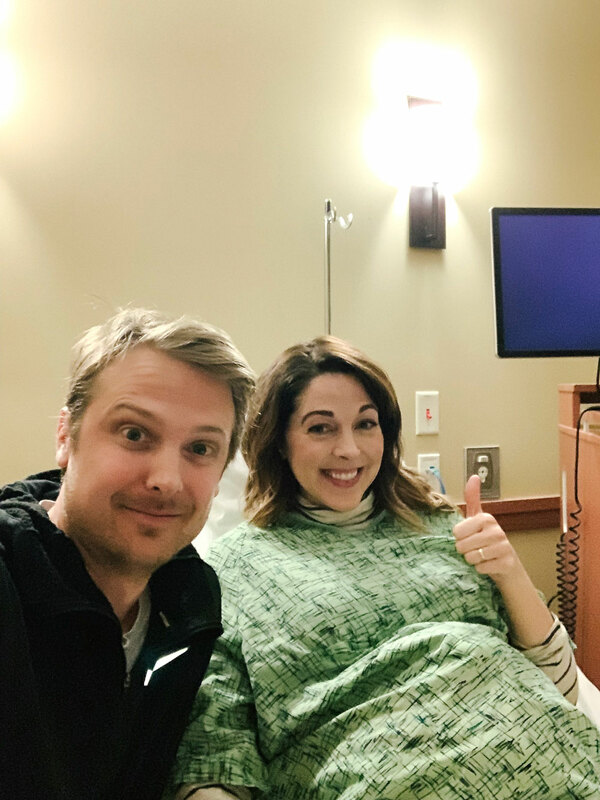 I’d like to think that my wife didn’t know how scared I was when she was in labor/going in for a c-section, but I also said, “We are never doing this ever again.” People always talk about how the endorphins that the birthing parent gets are so good and babies are so cute, etc., that the birthing parent forgets how horrible/scary/painful it was/can be. But, as the non-birthing parent I don’t think I’ve forgotton a second of those 38 hours. Congratulations! You are amazing. Congratulations with the birth of little Desi. May he grow up happy, healthy and strong. Enjoy him, they stay babies and totally dependent on you for a very short time. I’m so happy for you Suzy! He is absolutely adorable and you are right to be enjoying as much as you can at this time! When I read your very first posts I cried, but this post is just the happiest!!! You are hilarious, you & John WILL be great parents! (Right now you just don’t think so because your at one of the tuffest parts of being parents)! My son in law says we Mother’s have special powers, we operative on little to no sleep, we pull magic out of no where, and can create miracles! So as a mother I know you have it in you to be the same! You are blessed beyond measure. Peace to you & your family. You look marvelous, enjoy that special time with Desmond, there’s nothing like it. Plus I think Scrap is enjoying it too😍even if you get a stink eye every now and then!! Desi is adorable! What a sweetheart! Scrap is so cute! Getting used to a new human in the house must be hard! 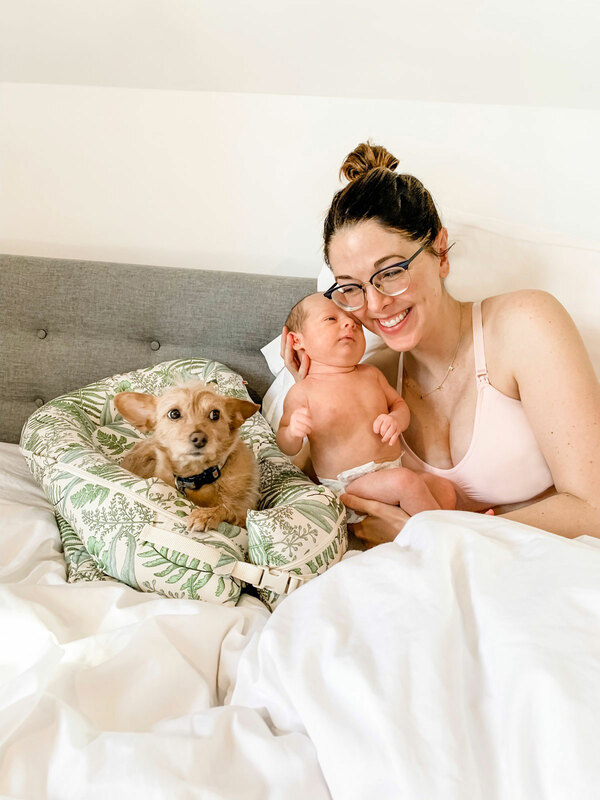 I love seeing all your pictures of your sweet family! A surprise C-section is definitely a shock! I pushed for two hours and had to have one because my little guy was stuck! Enjoy those sweet little snuggles! My little guy is already nine! It does not feel like it when you are getting no sleep, but it really does go fast…the days are long and the years are fast! LOL! 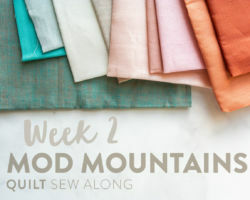 I cannot wait to do the mod mountains quilt!!! I live in the mountains in Co and this quilt will be perfect!!!! Thank you for doing this while you are so insanely busy! You are amazing! Congratulations to you and your husband for becoming parents to a precious baby boy! Love seeing Scrap sharing in the photo ops! So happy for you! Parenthood is a huge adjustment yes, but worth it all. Best of wishes as you enjoy the now and transition back to work! Congratulations! Life has now changed forever and you’ll wonder how you ever lived without that sweet baby boy! I hope you enjoy every precious minute! I couldn’t love this more! Take lots of time, he’s only this little once! 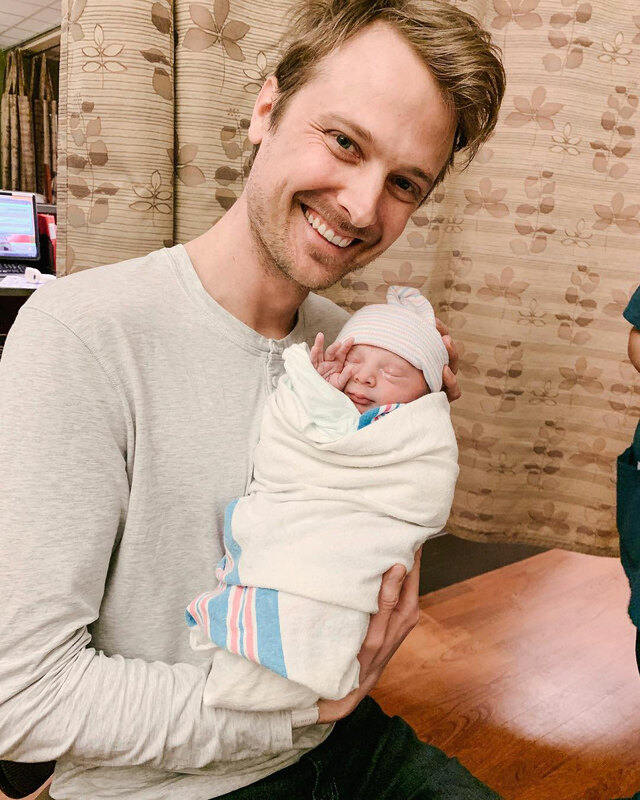 Congratulations, he is absolutely beautiful. And these are sweet sweet photos. What a wonderful time this is!! Great photos! You are happy. All the best! Wonderful post, Suzy! The joy jut comes shining through. Keep soaking up every minute, savor them and embed them in your heart and mind…babies are simply the best. One of mine just turned 42 (gasp!) yesterday and I can still remember how it was when he was new to the family. We’ll be here waiting when you are ready to lead us into the Mod Mointains. 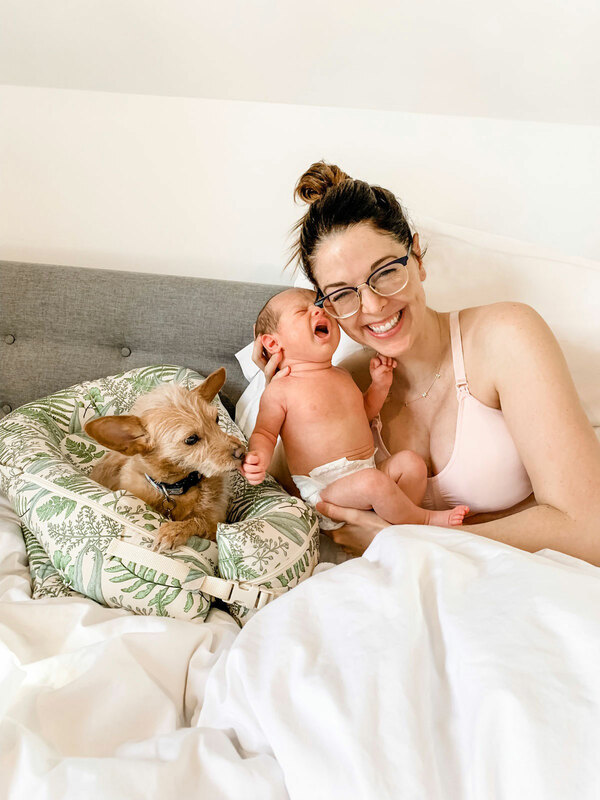 Motherhood is a hodgepodge of all emotions! April SAL sounds great….I swear I will finish Modern Fans before then! LOL. 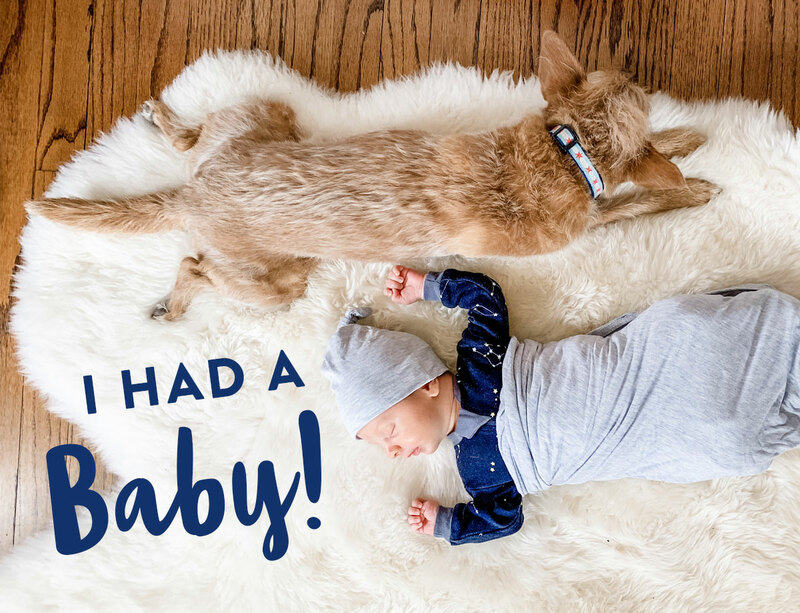 Congrats and snuggle while he’s immobile! Life changes fast! Before you know it, they are 40 years old and you are about the least important person in their life. Enjoy these days while he is young. They don’t last forever. 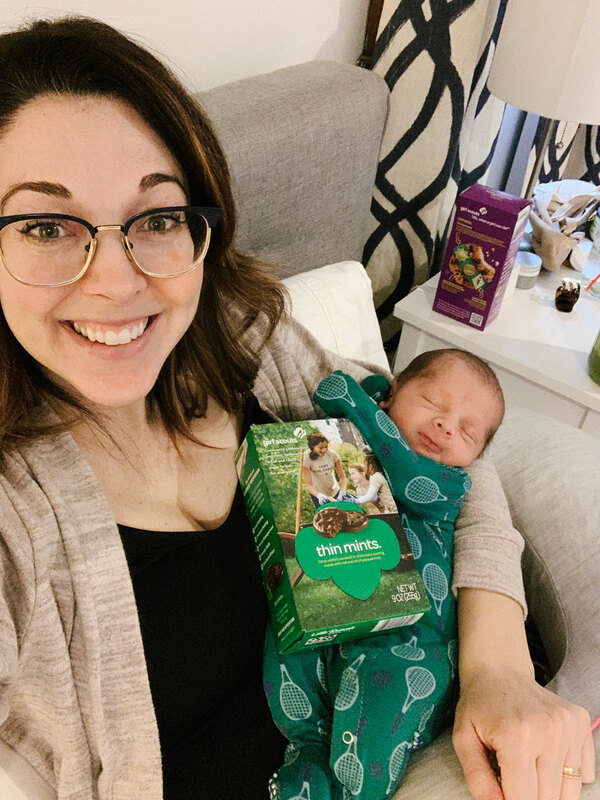 Such a wonderful post and already such a great mom! Thanks and Congratulations and I love your necklace! Congratulations! You all look great! Welcome to the world, may it be filled with adventures, love and grace. Congrats on the baby. What awesome facial expressions he has, totally cute. He’s so sweet and wonderful! Congratulations! 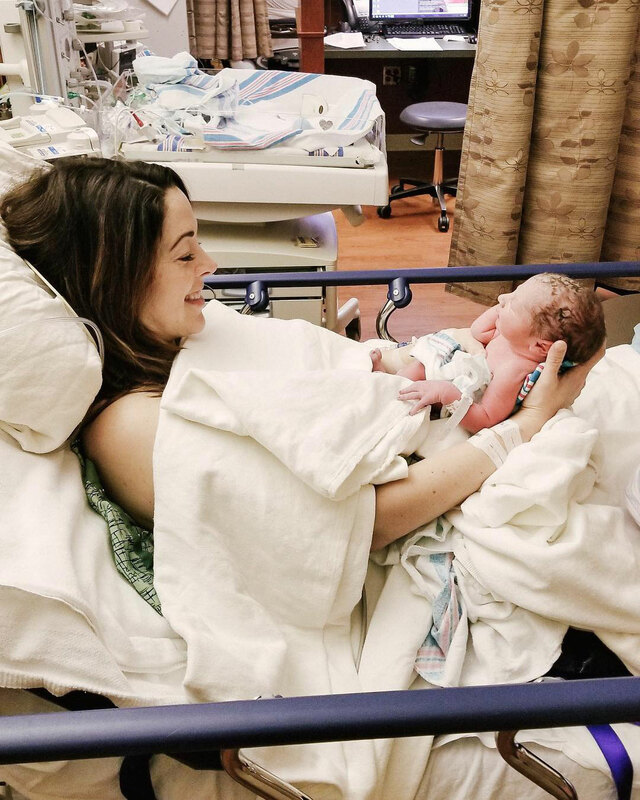 I too had an unplanned c-section…my little girl was 2 weeks late and coming one arm and one leg down the birth canal. It’s a little longer recovery and you may never wear a bikini again but worth all the effort! Congratulations! There’s nothing quite like this time when you are excited, exhausted, fascinated with the your new addition, sleep deprived and wondering how in the heck the end of the day came and you are still in your PJ’s. It’s even hard to find time to take a shower even though you desperately want one. But as so many others have pointed out, they do grow up fast. Those are wonderful photos. He’s just lovely. How did you know I’m still in my Pjs? 😉 Thanks, Maxine! 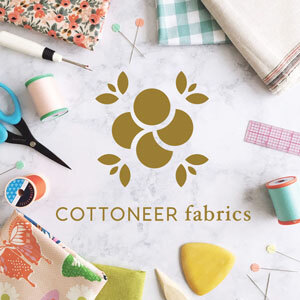 I’m new to your blog, having just discovered it a couple of days ago when I was searching for a tutorial on hand quilting. I’m glad I found you- you are fabulous! Your tutorial is better than anything else I’ve found! 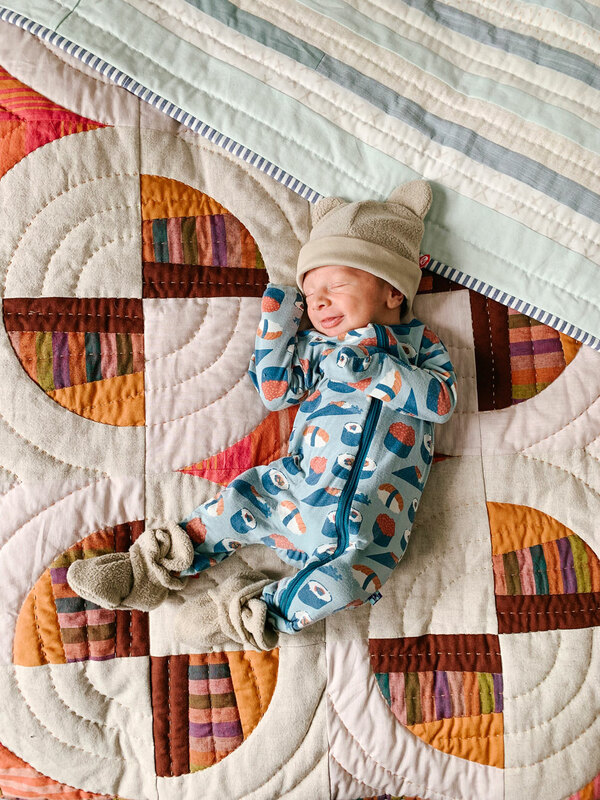 I can’t wait to further explore your quilty world! And can I just say that I love your little guy’s sushi sleeper?!? What a sweet comment! Thanks, Shannon! Oh my, Congratulations! What a beautiful story and I am so happy to hear about it all. One of our 13 grandchildren is named Desmond! I love that name so very much ( Desmond from “Lost” was the inspiration ). 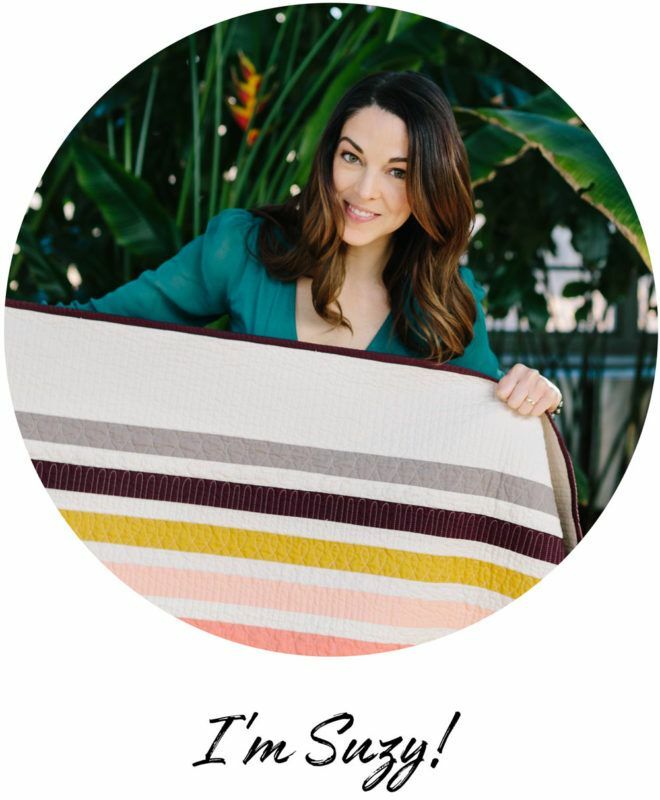 You 3 are a gorgeous family and very much enjoy seeing him on your fantastic quilts. He’s a beauty! Congratulations to you all! The best time in my life…enjoy every adorable moment! Oh Suzy! He is absolutely perfect! I am so happy for you all! Isn’t he just the best blessing!!? Enjoy every MINUTE! We’re all still be here whenever have time! Happy Birthday Desi! Congratulations on the gift of your beautiful, precious baby boy. He is just darling! 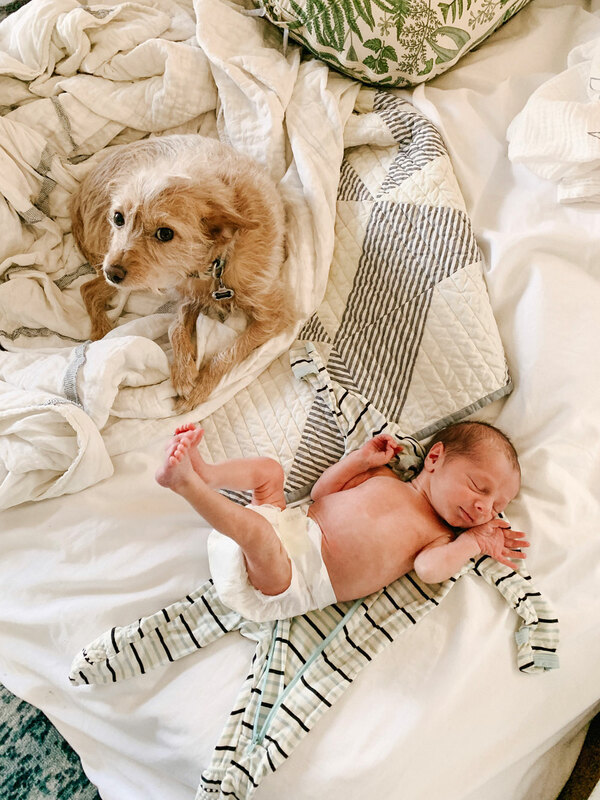 awwww have been following your adventures on Ig….hang in there mama you guys are going great!!!! Congrats Suzy!! Such a sweet baby! It’s a whole new ballgame now. Wishing you, John and Desi all the best….oh, and Scrap too! What a cup of cute! A new chapter in your life starts now. Enjoy it! Oh, Suzy! He is absolutely beautiful! All of us, your devoted fans, are so going to love watching him grow! Keep those photos coming. All the best to you, John, Desi and Scrap. He is beautiful! You are right to soak in this time. It is precious! This is the sweetest time. You are going to be an amazing mother. Can’t wait to see more pictures as he grows. Congrats! 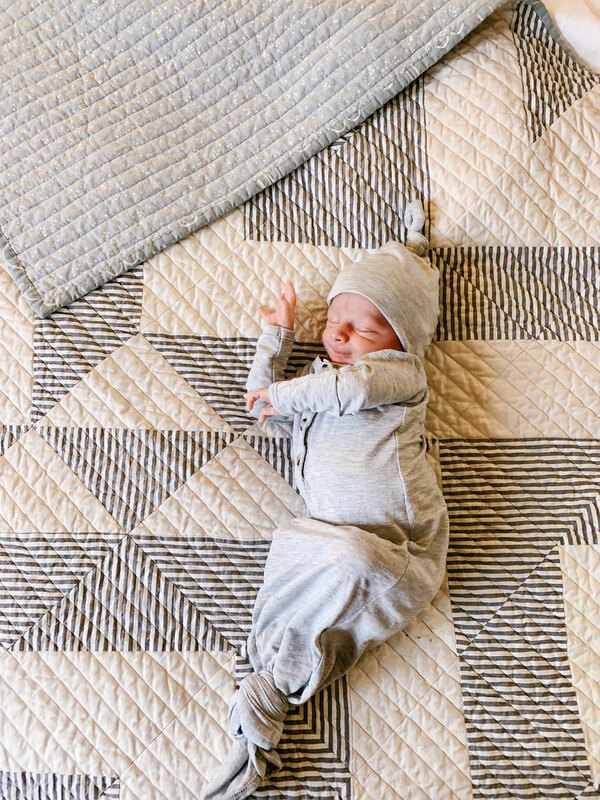 In addition to Scrap, you now have another model, Desmond, to show off your quilts. My daughter just had her 2nd son via c-section & I was reminded how difficult it is to lift (you can’t) or cough (ouch!) following her surgery. 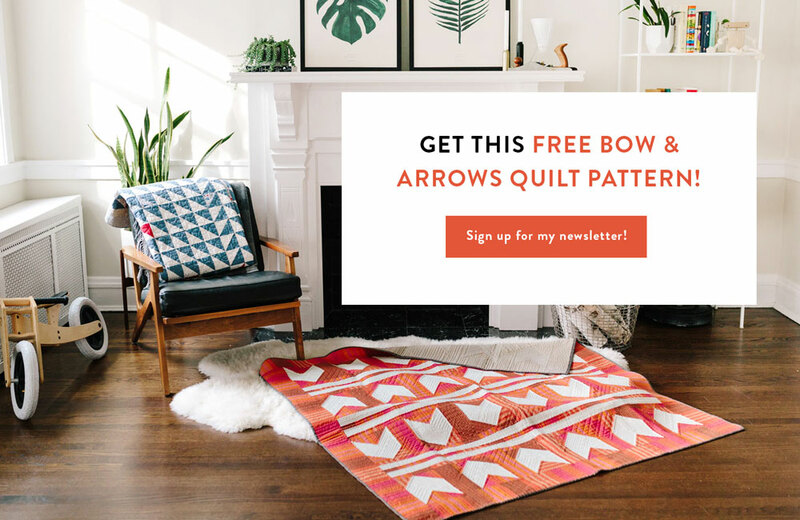 I love the next quilt you will be teaching….. perhaps I should attempt it. Love your Instagram & your blog. BTW, don’t attempt too much, too early! We will still be here waiting patiently….. remembering our own birth stories, days of messy hair, blurry eyes, dishes in the sink, quick meals, and fleeting glances at the time passing us by. It gets better each day! And before you know it, they are mobile, eating regular food, talking, and dragging you outside to play. Welcome to the world of mommy! Enjoy every minute, they grow up so fast. I was told that and thought ‘oh yeah’ but, they really do. Desi is beautiful, congrats to you and John. Scrap is a real cutie too!! Congratulations on your new little bundle!,! I wish you and your husband all the best in the world! Congratulations. Worth all the worry & hard work bless him. So happy for you Suzy! Your son is adorable. Thanks for sharing. Congratulations, Suzy and John. He is a cutie and so much hair! It is an amazing journey. Our daughter will be 44 this year and I’m still “Mom” and still treasure the time we spend together. Congratulations! Desi is adorable. You will be great parents. Congrats to you and your little family Suzy! My little boy is almost 8 months old now D-: and I, too, did not have the “birth story” that I had “planned” in my head-haha! At my routine 35 week appointment, it was discovered that my blood pressure had shot through the roof-I was admitted to the hospital that night. I freaked, internally, because my husband freaked externally lol. I was able to labor with lots of machines and bags and bumps along the way, but little Emmett finally entered the world at 35 weeks, 4 days. We were lucky in that he didn’t need any NICU time. Enjoy this time Suzy, like everyone says, it does go by so fast. I’m still sleep deprived, but Desi will get more expressive and learn new things each day… it is absolutely amazing. Congratulations to you. Your son is sooo cute. 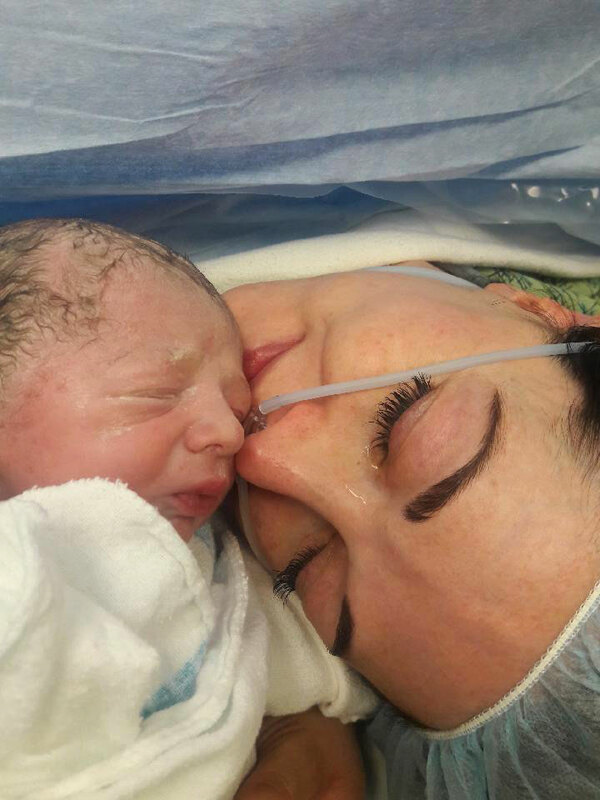 I thought I would NOT have another c-section after my son was born but went on to have 3 others which included twins weighing 6lbs 3oz & 7lbs & 4oz, but they are worth it. Look for a different prospective in your designs, life is taking on a new exciting meaning which will definitely show up. Again congratulations! Congratulations on the birth of your beautiful baby boy! You are blessed and the photos are great. Thank you for sharing such a happy moment in your life. Wow!!! Not much I can say that hasn’t been already said – but.. Wow! and Congratulations and you are all beautiful !!! Enjoy every moment and take your time getting back into the swing of things. These days go fast and you can’t get them back. Love the pics! Thanks for sharing. Ohh! I want a baby too! 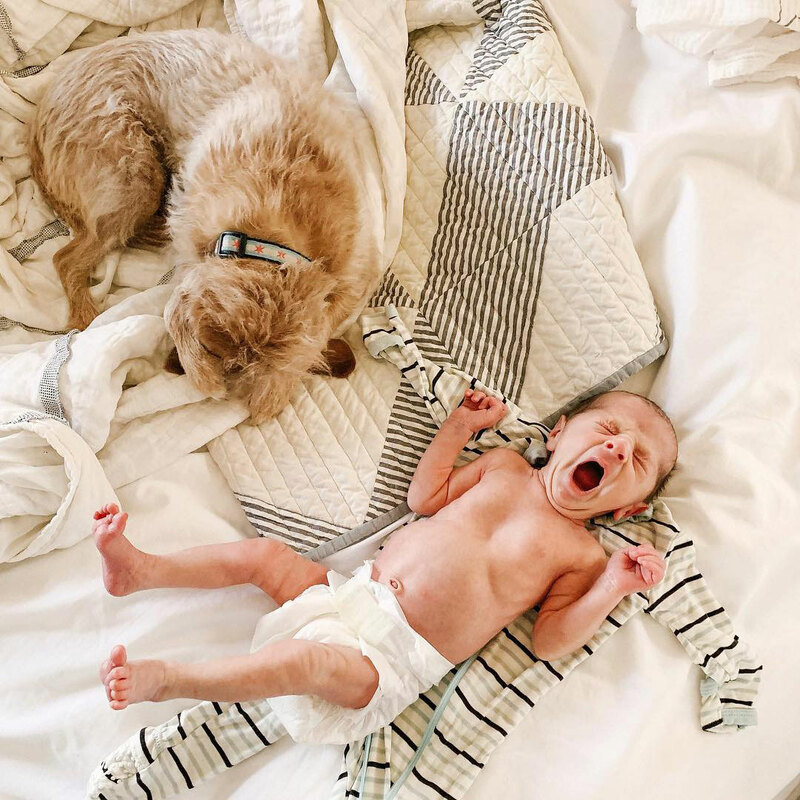 Even though I’m 71 years old and have two wonderful grown children and four adorable grandchildren, there’s just something about those baby noises and grimaces and stretches! I’m so glad to hear that everything worked out. Be kind to yourself! Congratulations to you on your Blessing! Congratulations to you and your husband on the birth of your little Desi. The photos you posted are fabulous. Enjoy your little guy everyday. They grow so quickly and the time goes by so fleetingly and before we know it the children are 18 years old and off to college. At least this is how it seemed for me. On another note, I am so happy to have come across your blog. 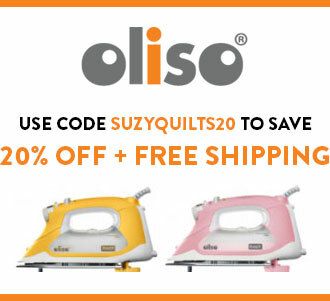 You have some wonderfully designed quilt patterns. I like your creative style. Congratulations to you and your husband! Enjoy every moment because time flies by fast. God bless your little family. Just beautiful! Congratulations to the new parents <3. Desi is precious. I am a special care nursery nurse and I LOVE my job. I enjoy parents like you who are doing this for the first time. SLEEP when you can and NEVER say NO to anyone who offers help. Make sure you tell them what they can do to help you and don’t feel like you need to entertain anyone. Love to you! 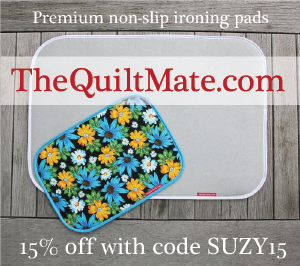 Well done and many congratulations Suzy – enjoy this time and thank you for your wonderful quilty inspiration along the way. 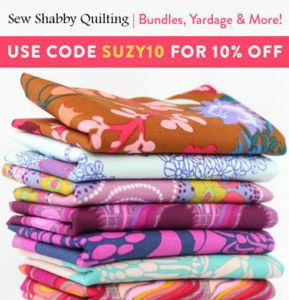 I am a first time quilter and so pleased that I have found Suzy Quilts! Congratulations on the birth of your beautiful baby boy, enjoy the journey ahead of you. Congratulations! My baby is 38 but I still remember that joy! Best of luck to your very great looking family! What a beautiful family! Thank you for sharing these precious pictures with us. All the heart eyes on this post! Suzy, Congratulations! Desmond Parker is exponentially glorious!! Enjoy him. You look fabulous!! Motherhood suits you!! Congrats on the birth of your beautiful son! Desmond is precious bundle of joy! Life only gets better! Take care and enjoy this special time….